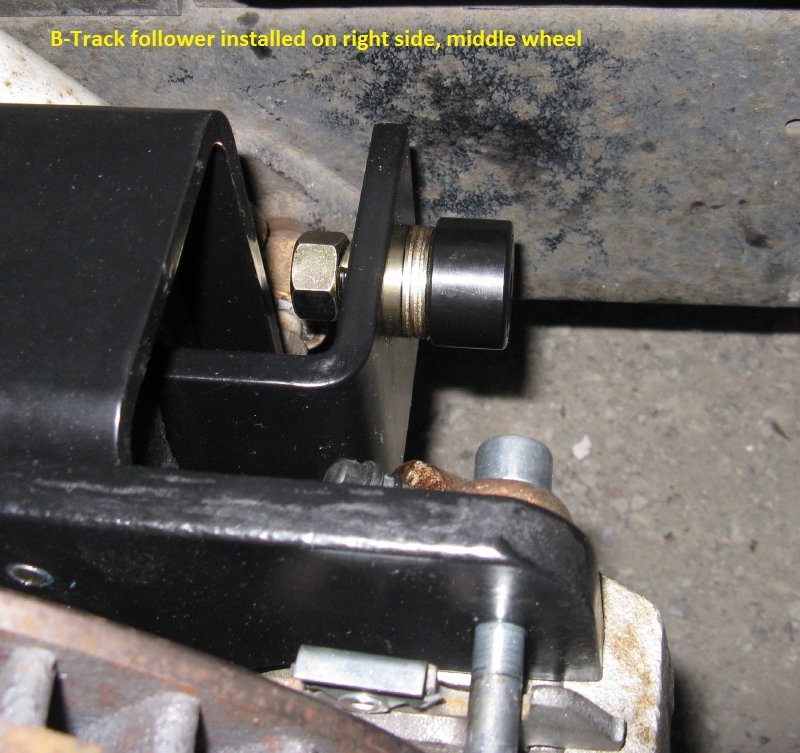 The optional Bogie Track or B-Track kit is installed only on the middle wheel. The track helps prevent the forward facing bogie arms from moving in or out excessively during turns. The angle-block is used in place of the plain block on the back of the torque boxes at the middle wheels. The angle portion should face toward the front of the coach, pointing inward towards the frame. 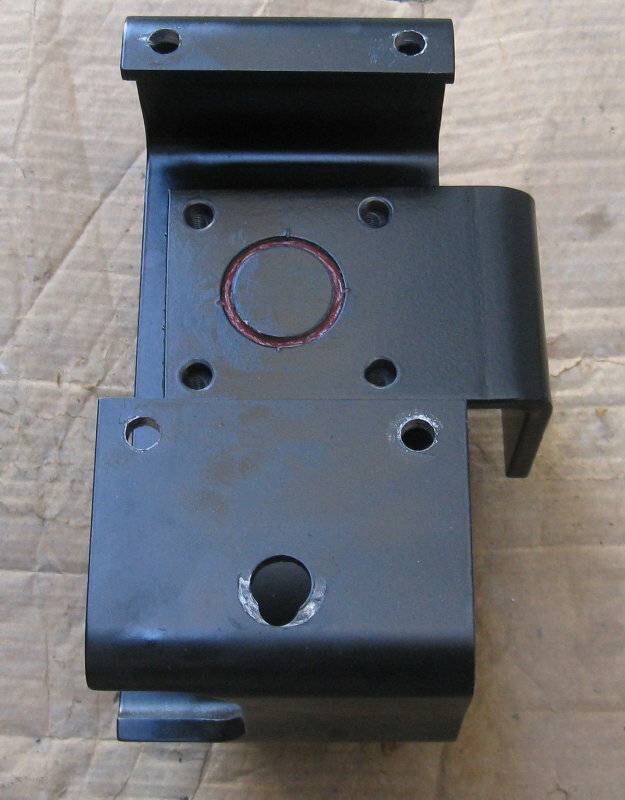 Shims are provided for use between the caliper plate and the torque box if required. Omit the shims if the torque box movement is too loose or the clearance to the back of the hubs is too close. The Cam Follower is bolted to the angle block. Washers are used to space the Cam Follower out. A washer, lock washer, and nut hold the Cam follower to the angle. Use an allen wrench in the end of the cam to hold it while tightening the nut. Tighten the nut most of the way, but leave enough looseness that you can move the cam in the slot while you adjust it to the track placement. Bolt the track to the frame using two 3/8" bolts, lock washers, and nuts. The track should be placed so that the angle-block clears the track throughout the full range of bogie arm travel, with the cam follower engaged in the track. This is usually about 1/4 to 1/2" foward of the lower shock mount, but you should verify placement on your coach. Make sure there are no wires, hoses, etc, behind the frame rail when drilling holes for the track. On the passenger side, the exhaust pipe makes getting the bolts in more difficult. A tip from Manny is to use a piece of string (eg dental floss) through the hole to help guide the bolt into place. In other words, push the string through the hole, tie the inside end to the tip of the bolt threads, and then pull the string to help guide the end of the bolt into the hole. I found I needed to cut a notch in the bottom of the track to allow the parking brake cable to pass through. Manny may have addressed this in later kits. 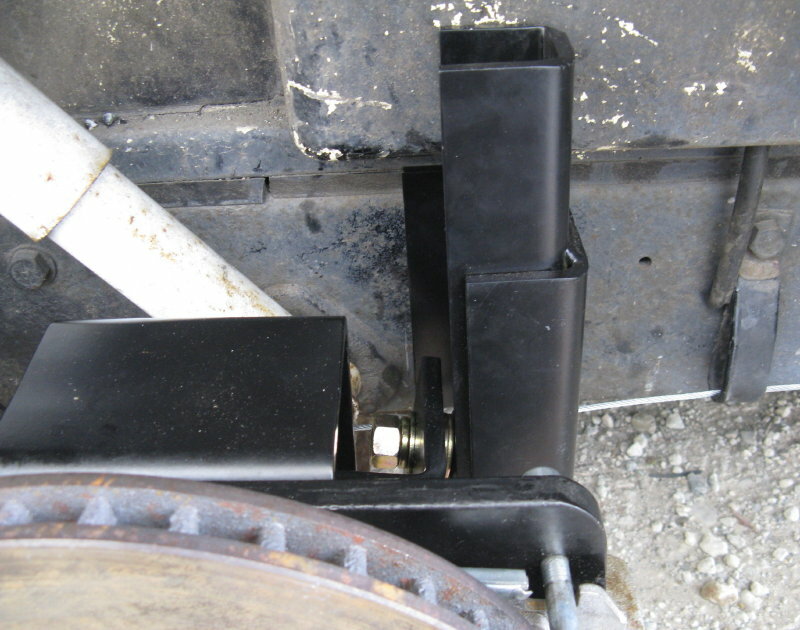 Tighten the cam follower after you've placed the track so that the cam rides evenly in the track throughout the full range of the bogie arm travel. To tighten the cam, you can usually get an allen wrench into the end of the cam by moving the bogie arm to the top of its travel. Once you've installed the track, verify the cam fits correctly into the track through the full range of travel on the bogie arm. If the coach frame is not plumb, it may be necessary to shim the track so the cam can track correctly.